Engineered Arabidopsis plants were treated with the ionic liquid (IL) 1-ethyl-3-methylimidazolium acetate 1-ethyl-3-methylimidazolium acetate ([C2C1im][OAc]) at 10 % wt biomass loading at either 70 °C for 5 h or 140 °C for 3 h. After pretreatment at 140 °C and subsequent saccharification, the relative peak sugar recovery of ~26.7 g sugar per 100 g biomass was not statistically different for the wild type than the peak recovery of ~25.8 g sugar per 100 g biomass for the engineered plants (84 versus 86 % glucose from the starting biomass). Reducing the pretreatment temperature to 70 °C for 5 h resulted in a significant reduction in the peak sugar recovery obtained from the wild type to 16.2 g sugar per 100 g biomass, whereas the engineered lines with reduced lignin content exhibit a higher peak sugar recovery of 27.3 g sugar per 100 g biomass and 79 % glucose recoveries. The engineered Arabidopsis lines generate high sugar yields after pretreatment at 70 °C for 5 h and subsequent saccharification, while the wild type exhibits a reduced sugar yield relative to those obtained after pretreatment at 140 °C. Our results demonstrate that employing cell wall engineering efforts to decrease the recalcitrance of lignocellulosic biomass has the potential to drastically reduce the energy required for effective pretreatment. Liquid transportation biofuels derived from sustainable lignocellulosic biomass have the potential to significantly reduce greenhouse gas emissions relative to petroleum-derived fuels. While significant progress has been made in improving the economic viability and commercial scalability of renewable biofuels, there remain significant challenges that must be addressed before these processes reach their full potential [1–3]. These challenges include the relatively low energy density of the biomass feedstocks, the recalcitrance of the plant cell walls to enzymatic hydrolysis [1–3], and the current high cost of pretreatment required to reduce this recalcitrance . Biomass pretreatments that use certain ionic liquids (ILs), such as 1-ethyl-3-methylimidazolium acetate ([C2C1im][OAc]), have been shown to help overcome biomass recalcitrance by increasing surface area and by partially or completely solubilizing the cell wall, decreasing cellulose crystallinity, increasing cellulose accessibility, and/or removing lignin [4–10]. One technique to monitor IL pretreatment is imaging the autofluorescence of biomass during IL pretreatment. These imaging studies have shown that a key step in biomass pretreatment using [C2C1im][OAc] is cell wall swelling [9, 11]. The composition of the biomass and extent of delignification further affect biomass recalcitrance and saccharification kinetics [4, 6, 12–16]. Increasing the accumulation of polysaccharides in biomass and improving biomass digestibility would have significant beneficial impacts on the cost of lignocellulosic biofuel production, both by increasing fermentable sugar yield per acre and reducing the severity of pretreatment [2, 17]. The secondary cell walls in Arabidopsis are composed of cellulose (40 %), matrix polysaccharides (~35 %) and lignin (~20 %; primarily G and S units) [18–20]. Secondary cell walls are deposited on top of the primary cell wall in specific tissues (e.g., vessels and fibers) to provide rigidity and strength. Recently, a new approach using synthetic biology was developed in Arabidopsis to decrease lignin content in fibers while retaining its deposition in vessels [21, 22]. In contrast to most approaches used to reduce lignin content [23–25], this one had no obvious impact on phenotype and plant growth. The engineering consisted of replacing the promoter controlling the expression of the second gene in the lignin pathway (C4H) that controls the metabolic flux of lignin biosynthesis via the vessel-specific promoter corresponding to the transcription factor VND6. This low lignin line was further engineered to enhance polysaccharide deposition in plant fiber cells using an artificial positive feedback loop technology that allows for the targeted overexpression of a key transcription factor, NST1, known to control secondary cell wall deposition in fibers [21, 26]. The combination of both approaches resulted in decreased biomass recalcitrance that generated higher yields of fermentable sugars on a per plant basis after hot water pretreatment followed by enzymatic hydrolysis . To understand the full impact of these cell wall modifications on IL pretreatment, we investigated [C2C1im][OAc] biomass pretreatment on one low lignin line (LLL, line #135 in ) and two low lignin high polysaccharide lines (LLHPL1, line #89 in  and LLHPL2, line #60 in ). LLHPL1 and LLHPL2 were selected due to their different levels of polysaccharide accumulation . The main objectives were to gain insight of the effect of cell wall modification on biomass deconstruction using ILs and to determine if the IL pretreatment process could be carried out at lower temperatures as a result of these modifications. We report the impact of these engineered lines relative to wild type (WT) in terms of pretreatment efficacy, sugar yields, and mass balances for IL pretreatment at 70 and 140 °C using [C2C1im][OAc] followed by saccharification using commercially available enzyme mixtures. Mature, senesced stems (corresponding to the main stems and side branches depleted of seeds and cauline leaves) from multiple plants of the WT, LLL, LLHPL1, and LLHPL2 Arabidopsis lines grown under the same conditions were collected and milled, and the chemical composition was quantified. As previously reported, all the lines (LLL, LLHPL1, and LLHPL2) harboring the pVND6::C4H construct, exhibit a significantly lower lignin content (12.9 to 14 %) compared to that of WT (19.1 %) and had no visible phenotypic differences (Table 1, Fig. 1) . As expected, LLHPL1 shows an increase in the amount of both glucose 30.4 % and xylose 16.1 % present versus WT (26.1 and 11.4 % respectively). The LLHPL2 showed only a minor increase in xylose, 11.7 %, for the bulk composition and a significant decrease in the amount of glucose present, 22.1 %, where previously it was found to have a significant increase on a per plant scale . Both the LLL and LLHPL2 engineered Arabidopsis lines exhibit a significant increase in acid soluble residue (ASR), while LLHPL1 had an increase in glucose with little change in ASR compared to WT (Table 1). We pretreated the WT and the engineered strains with [C2C1im][OAc] at 10 % (w/w) biomass loading at 140 °C for 3 h (Fig. 2) [8, 10, 27, 28]. The pretreated slurry was washed with water as an anti-solvent, precipitating a solid. The lignin concentrations of the pretreated solids from the reduced lignin lines were confirmed to be significantly lower than WT (~20 % lignin in the engineered lines and ~30 % lignin in the WT, Table 2) with insignificant differences in the amount of glucose and xylose removed for the engineered lines (Table 2). The WT had a significantly higher glucan recovery in the after IL pretreatment, as compared to the engineered lines where glucan recoveries of 86, 70, and 74 % were quantified for LLL, LLHPL1, and LLHPL2, respectively. Less than 50 % of xylan was recovered in the solids after pretreatment for all of the Arabidopsis lines tested (Table 2), and all three of the reduced lignin lines had a significant increase in ASR in the recovered biomass after IL pretreatment as compared to the WT (Table 2). The recovered solids from the Arabidopsis lines after [C2C1im][OAc] pretreatment were then saccharified using a commercial cellulase (CTec2) and hemicellulase (HTec2) enzyme mixture . The yields of glucan after saccharification for LLL, LLHPL1, and LLHPL2 were >95 % and significantly higher than those obtained from samples with no pretreatment (Table 3). There was no difference in the saccharification efficiency for xylan yields between the three modified plant lines. This resulted in final glucose yields of 69 to 87 % recovery in terms of the initial amount present in the samples before pretreatment. These glucose yields were not significantly different between the WT, LLL, and LLHPL2 samples but were significantly lower for glucose and xylose released from LLHPL1 compared to the WT, as well as xylose released from the LLL sample (Table 3, Fig. 2). All of the Arabidopsis samples were observed to swell during IL pretreatment at 140 °C for 3 h (see Additional files 1, 2, 3, and 4: Movies 1–4). The observed rate of dissolution due to [C2C1im][OAc] pretreatment, however, was slower for the WT than the engineered lines (Fig. 3, Additional file 5: Figure S1). Due to the relatively minor differences observed in the rate and extent of dissolution at 140 °C, the temperature was reduced to 70 °C to determine if there were any significant differences observed in swelling and dissolution between the WT and LLHPL2. At this set of pretreatment conditions, there was an initial swelling step observed after 1 h of pretreatment, followed by the onset of extensive swelling after 3–4.5 h (Additional file 6: Figure S2, Additional files 7 and 8: Movie 5 and 6). Based on these results, a pretreatment incubation of 5 h at 70 °C was selected as the new pretreatment condition (Fig. 4). The Arabidopsis lines WT, LLL, LLHPL1, and LLHPL2 were pretreated in [C2C1im][OAc] at 70 °C for 5 h. The pretreated plant biomass was then precipitated and analyzed for composition (Fig. 5, Table 4). All of the lines had significantly lower solid recoveries (70.7 to 80.6 %) than those of the WT (96 %, Table 4), yet the three engineered lines had similar glucose and xylose recoveries in the pretreated solids as the WT (WT >94 % glucose, >106 % xylose, relative to initial biomass, Table 4). Furthermore, all of the Arabidopsis lines had minimal lignin removal (between 3 to 11 %) after pretreatment (Table 4). The recovered solids from the different Arabidopsis lines after [C2C1im][OAc] pretreatment at 70 °C for 5 h were then saccharified. While there was less than 11 % removal of lignin, glucose yields of 76, 79, and 81 % were obtained for LLL, LLHPL1, and LLHPL2, respectively, and the saccharification efficiency was significantly greater for LLHPL1 and LLHPL2 than that of WT (67 %, Table 3). The resulting release of glucose relative to initial levels in the biomass was 62 % of the initial glucose for the WT, 76 % for the LLL, 63 % for the LLHPL1, and 79 % for the LLHPL2 (Table 3, Fig. 5). There was minimal detectable xylose released (1 %) during saccharification for the WT; however, the three engineered lines had a significantly higher xylose yields of 46 to 58 %. In addition to the high recovery of glucose (63–79 %) and xylose (46–58 %) at the lower pretreatment temperature, the enhanced concentration of cellulose and hemicellulose per gram of starting biomass resulted in higher monomeric sugar release in all of the engineered lines (Figs. 2, 5, and 6). Both LLHPL1 and LLHPL2 have significantly increased total sugar recovery (27.3 and 24.2 g total sugar per 100 g starting biomass) as compared to the 16.2 g total sugar per 100 g starting biomass of the WT (Fig. 6, Additional file 9: Tables S1 and S2). While there are similar recoveries and enhanced total sugar release, the saccharification kinetics are slower for the biomass pretreated at 70 °C than those pretreated at 140 °C (Table 5). After pretreatment at 70 °C for 5 h, the initial rate of glucose release for the WT was 86 mg/L/min, and the rates for the three engineered lines were between 40 to 52 mg/L/min. The rate of xylose release was below the detectable limit for WT, while the initial rate of release for xylose was significantly higher, between 46 to 68 mg/L/min, for the engineered lines. As the composition of both LLHPL1 and LLHPL2 are different, so were the rates of sugar released during saccharification. [C2C1im][OAc] pretreatment at 70 °C for 3 days has been shown previously to release less sugar than pretreatment at 140 °C for 3 h . The reduced lignin Arabidopsis lines, however, all show increased sugar release after pretreatment at 70 °C, highlighting the impact of plant cell wall modifications on pretreatment severity and related energy requirements. The impact of engineering secondary cell wall structure in Arabidopsis with a selective reduction of lignin and an enhancement of cellulose accumulation was evaluated in terms of pretreatment efficacy, sugar yields, and energy requirements. The reduced lignin Arabidopsis engineered lines resulted in high levels of monomeric sugar release at lower pretreatment temperatures as compared to the wild type. Ionic liquid pretreatment of the engineered Arabidopsis using [C2C1im][OAc] at 70 °C for 5 h resulted in improved saccharification efficiency and increased hemicellulose recovery for the pretreated biomass and produced similar total sugar yields as compared to those obtained after pretreatment at 140 °C for 3 h. The similar sugar recovery obtained for the engineered lines at the lower temperature pretreatment supports the hypothesis that reducing lignin can reduce the necessary severity of pretreatment needed and increased polysaccharide deposition can increase glucose recovery on a mass basis. Secondary cell wall regulatory networks are only partially understood and seem to be conserved across many species from dicot to monocot plants [30–32]. For example, an Arabidopsis nst1/nst3 double T-DNA insertional mutant lacking expression of both NST1 and NST3 transcription factors that control secondary cell wall deposition in fiber cells could be complemented by the expression of NST1 transcription factor orthologs derived from poplar or rice under the control of the Arabidopsis NST1 promoter [33, 34]. This had an effect on the ASR amounts between the engineered lines, which could be important for pretreatment and sugar recovery. This suggests that a similar approach for cell wall engineering could be implemented into other vascular plant species to enhance polysaccharide deposition in secondary cell walls. The different levels of sugar recovery between LLHPL1 and LLHPL2 demand further investigations into the optimal expression levels and patterns of C4H and NST1. Using this selective strategy to reduce lignin deposition and enhance carbohydrate composition of specific cellular structures in a more diverse group of vascular plants could create higher yielding feedstocks that require less energy to process, thereby, improving the overall economics of biofuel production. Wild type Arabidopsis thaliana (ecotype Columbia) and the three engineered lines named LLL, LLHPL1, and LLHPL2 correspond to c4h + pVND6::C4H, c4h + pVND6::C4H-pIRX8::NST1 line # 89 and line # 60, respectively, in Yang et al. . The wild type Arabidopsis ecotype Col0 (WT) is our reference plant. The pVND6::C4H gene construct was used to complement the Arabidopsis c4h lignin mutant (ref3-2) [35, 36] and correspond to replacing the promoter for the second gene (C4H) in the lignin synthesis pathway with a promoter that is primarily expressed in vessel cells. This LLL plant line (c4h lignin mutant harboring the pVND6::C4H gene construct) was further engineered with pIRX8::NST1 construct  corresponding to the artificial positive feedback loop to increase secondary cell wall polysaccharide deposition. Two independent lines were generated  and were named LLHPL1 and LLHPL2 in this study. The lines LLHPL1 and LLHPL2 have been previously characterized, while having the same constructs, they have unique pIRX8::NST1 construct insertion sites resulting in compositional differences on a per plant basis . Arabidopsis plants were grown in soil under short-day conditions for 5 weeks (10 h:14 h/light:dark cycle) before being transferred to long-day growth conditions (14 h:10 h/light:dark cycle) until mature at 150 μmol/m2/s, 22 °C, and 60 % humidity. The Arabidopsis main stems and side branches depleted of seeds and cauline leaves were pooled and milled to 40 mesh (0.255–0.451 mm) by a Wiley mill. All experiments were done in triplicate from different samples of the milled biomass. 1-ethyl-3-methylimidazolium acetate, [C2C1im][OAc], was purchased from BASF (lot no. 08–0010, purity >95 %, BasionicsTM BC-01, BASF, Florham Park, NJ, USA) and used as the IL for all pretreatments. The Arabidopsis was stored at 4 °C in a cold room before use. Arabidopsis was pretreated with [C2C1im][OAc] at both 70 °C for 5 h and 140 °C for 3 h using a previously published protocol [8, 10]. Biomass loading in [C2C1im][OAc] was 10 % (w/w) with 2 g of starting biomass for each replicate. After pretreatment, the samples were thoroughly mixed, and hot water as an anti-solvent was added at 3.5 times the initial total mass (of both biomass and IL) to recover any solubilized biomass. The mixture of IL, water, and biomass was centrifuged to separate the solid (biomass) and liquid ([C2C1im][OAc] and water) phases. The recovered solid was lyophilized (Labconco FreeZone(12), Kansas City, MO, USA) and used for analysis. Structural carbohydrates (including glucan and xylan) of Arabidopsis, before and after pretreatment (Tables 1, 2, and 4), were determined according to the two-step acid hydrolysis procedure of the National Renewable Energy Laboratory (NREL) . Carbohydrates were diluted 100 fold and analyzed by HPLC. All values are reported ± one standard deviation (SD) unless noted. Acid insoluble lignin content of the untreated and pretreated Arabidopsis samples was determined using the two-step acid hydrolysis procedure of the National Renewable Energy Laboratory (NREL) . All values are given with SD unless noted. Enzymatic saccharification of pretreated and untreated Arabidopsis samples was carried out at 50 °C and 150 rpm in a reciprocating shaker (Enviro-Genie, Scientific Industries). Hydrolysis reactions were carried out in 5 mL of 50 mM sodium citrate buffer (pH of 4.8) with 10 % biomass loading. The glucan content in the solution was maintained at 5 g glucan per liter. For hydrolysis reactions, 20 mg protein/g glucan of Cellic® CTec2 (Novozymes, Davis, CA, USA) and 2 mg protein/g xylan of Cellic® HTec2 (Novozymes) were used. To monitor hydrolysis kinetics, 60 μL of the supernatant was taken at specific time intervals (0, 0.5, 1, 3, 6, 24, 48, and 72 h). The supernatants were centrifuged at 10,000 g for 5 min, and the released sugars in the supernatant were measured using solutions of D-glucose as calibration standards and high performance liquid chromatography. The untreated Arabidopsis controls were run concurrently with the 140 °C samples to eliminate potential variances in temperature, humidity, or mixing. The initial rate of hydrolysis was calculated based on the sugar released in the first 30 min of hydrolysis . The supernatant collected after 72 h of hydrolysis was analyzed with HPLC for the enzymatic efficiency. All assays were performed with three replicates. Arabidopsis samples from random sections of stem plant with similar diameter were sliced at 100 μm with a vibratome (Leica VT1000S, Microsystems Inc. Buffalo Grove, IL, USA). These sections were then stored at 4 °C until used in the imaging study. Slices were placed between a coverslip and slide with enough [C2C1im][OAc] to wet each sample (about 150 μL) and a thermocouple. The slide was placed in a temperature controlled (LakeShore model 331, Westerville, OH, USA) in-house heater (Advanced Light Source, LBNL). Samples were started at room temperature and ramped to the specified temperature during imaging to using the high heat setting. Samples, on average, reached the specified temperature (70 or 140 °C) before 30 min and fluctuated ± 5 °C. Autofluorescent images during heating were collected with a Zeiss LSM 710 confocal system mounted on a Zeiss inverted microscope (Carl Zeiss Microscopy, LLC, Thornwood, NY, USA). Images were collected every 20 to 30 min, and select images are shown (Figs. 3 and 4). A 405 nm diode laser and a 488 nm argon laser were used for excitation. Fluorescence emission was collected with a 10× or 40× objective and was represented using pseudo colors for three channels: 410 to 469 nm (blue), 504 to 581 nm (green), and 592 to 759 nm (red). The resulting images were analyzed using the Zen software (Carl Zeiss Microscopy) to measure the changes of cell wall thickness. Statistical analyses were calculated using ProStat (v 5.01, Poly Software International, Pearl River NY, USA). Significance is indicated with the following: P < 0.05*, P < 0.01**, P < 0.005***, P < 0.001****. Multiple comparisons were done with One-way ANOVA with post-hoc Tukey’s HSD. Full results of the statistical analysis can be found in the table and figure legends. This work, conducted by the Joint BioEnergy Institute, was supported by the Office of Science, Office of Biological and Environmental Research, of the US Department of Energy under Contract No. DE-AC02-05CH11231. Additional file 1: Movie 1. Confocal fluorescence imaging of WT Arabidopsis during [C2C1im][OAc] pretreatment at 140 °C. Autofluorescence of 100 μm slices of the stems from during [C2mim][OAc] pretreatment at 140 °C over 3 hours. The temperature ramp from ambient conditions to 140 ± 5 °C occurring during time 0 to 46 min. 5× magnification, 10 frames per second. Additional file 2: Movie 2. Confocal fluorescence imaging of LLL Arabidopsis during [C2C1im][OAc] pretreatment at 140 °C. Autofluorescence of 100 μm slices of the stems from during [C2mim][OAc] pretreatment at 140 °C over 3 hours. The temperature ramp from ambient conditions to 140 ± 5 °C occurring during time 0 to 46 min. 5× magnification, 10 frames per second. Additional file 3: Movie 3. Confocal fluorescence imaging of LLHPL1 Arabidopsis during [C2C1im][OAc] pretreatment at 140 °C. Autofluorescence of 100 μm slices of the stems from during [C2mim][OAc] pretreatment at 140 °C over 3 hours. The temperature ramp from ambient conditions to 140 ± 5 °C occurring during time 0 to 46 min. 5× magnification, 10 frames per second. Additional file 4: Movie 4. Confocal fluorescence imaging of LLHPL2 Arabidopsis during [C2C1im][OAc] pretreatment at 140 °C. Autofluorescence of 100 μm slices of the stems from during [C2mim][OAc] pretreatment at 140 °C over 3 hours. The temperature ramp from ambient conditions to 140 ± 5 °C occurring during time 0 to 46 min. 5× magnification, 10 frames per second. Additional file 5: Figure S1. Enlarged view of [C2C1im][OAc] pretreatment on Arabidopsis (a, WT, b, LLL, c, LLHPL1, d, LLHPL2) for pretreatment at 140 °C at 3 hours with temperature increase from ambient to 140 ± 5 °C during the first 30 min, scale bar 500 μm. Additional file 6: Figure S2. Analysis of confocal imaging of autofluorescence comparing cell wall swelling during IL pretreatment with [C2C1im][OAc] at 70 °C for 12 hours of 100 μm slices from Arabidopsis engineered lines as measured by change of area min normalized to 0 and max normalized to 1. Data shown for 3 individual swelling experiments (two separate experiments on the LLHPL2 engineered line (LLHPL2a and LLHPL2b and) and one WT). Area was calculated in (ImageJ, NIH). The changing in swelling ends around 5 hours and remains relatively constant for the next 6 hours for all of the lines. 5 hours was chosen as the duration for the pretreatment at 70 °C. Additional file 7: Movie 5. 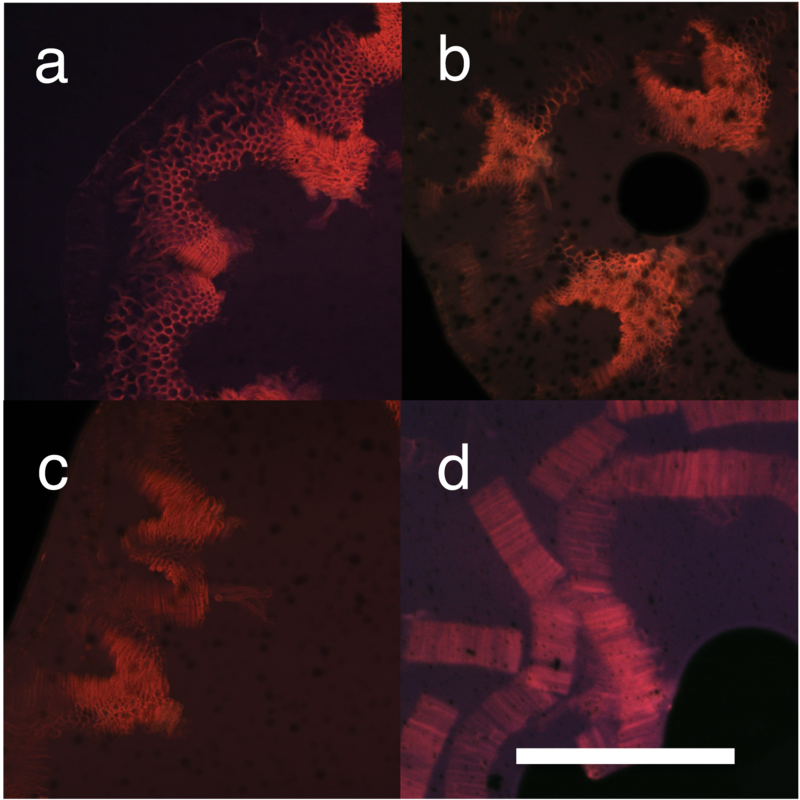 Confocal fluorescence imaging of WT Arabidopsis during [C2C1im][OAc] pretreatment at 70 °C. Autofluorescence of 100 μm slices of the stems from during [C2mim][OAc] pretreatment at 70 °C over 24 hours. The temperature ramp from ambient conditions to 70 ± 5 °C occurring during time 0 to 46 min. 5× magnification, 10 frames per second. Additional file 8: Movie 6. Confocal fluorescence imaging of LLHPL2 Arabidopsis during [C2C1im][OAc] pretreatment at 70 °C. Autofluorescence of 100 μm slices of the stems from during [C2mim][OAc] pretreatment at 70 °C over 24 hours. The temperature ramp from ambient conditions to 70 ± 5 °C occurring during time 0 to 46 min. 5× magnification, 10 frames per second. Additional file 9: Tables S1 and S2. Table of Tukey’s HSD post-hoc comparison of glucose, xylose or total sugar recovered between the different engineered lines of Arabidopsis versus each other at each pretreatment condition. Table of Tukey’s HSD post-hoc comparison of glucose, xylose or total sugar recovered versus pretreatment condition versus the different engineered lines of Arabidopsis. CS carried out pretreatment and imaging studies, data analysis, and drafted the manuscript. AC participated in the pretreatment and imaging studies and helped draft the manuscript. DL designed, grew, and harvested the Arabidopsis and helped draft the manuscript. BS, SS, and YC participated in the design of the study and drafting of the manuscript. All authors read and approved the final manuscript.